Download this free invitation template. 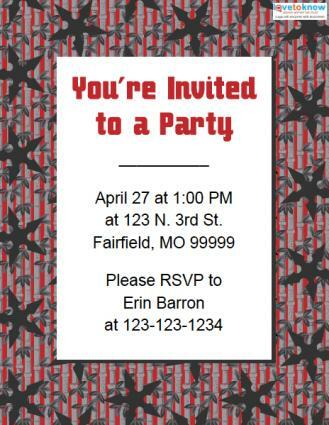 There's no better way to let potential guests know your child's having a ninja-themed birthday party than by sending them a matching invitation. Luckily, ninja invitations aren't difficult to find, whether you prefer to download them for free or purchase your favorite design. Print your invitations on card stock. Print one invitation and check it carefully for typos or misinformation. Once your invitation is exactly as you want it, make sure your printer has plenty of ink and print the rest of your invitations. Download this free birthday invitation. If you'd like to see more birthday invitation options, the following websites offer some really cute ninja designs for boys and girls. Zazzle offers one of the largest collections of customizable ninja invitations on the Internet, and Ninja Power and Ninja Smiley Face are two of many designs to check out. Many styles include color options as well as a choice between horizontal and vertical invitations. The starting price per invitation hovers around the $2 mark for all of their designs. Standard white envelopes are included, and savings are offered on larger orders. Pear Tree Greetings has just two ninja invitations to choose from, but they're worth a look. The ninja mask design is an actual mask with pop-out holes for the eyes. You can coordinate the colors on the invitation with the rest of your party decorations, or simply choose your child's favorite color. The Sneaky Ninja design comes in colors for boys or girls with stickers to hold the invitations closed. A minimum of eight customized invitations and standard envelopes runs between $17 and $18, and the price per invitation decreases for larger orders. 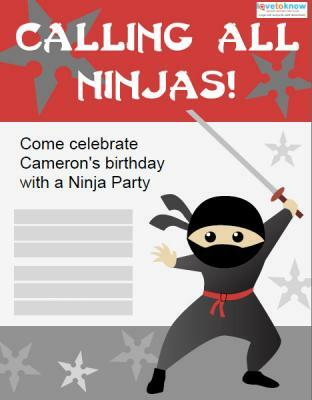 Birthday Express offers just one type of ninja birthday party invitation, and it's the kind you fill in by hand. The design is more comic-book style than cute, so it could be the right choice for an older child. Priced around $4 for eight invitations and envelopes, this could be a good option if you'd like to save on invitations so you can spend more money on other party supplies. Party City offers the ever-popular Ninja Turtles invitation sets complete with green envelopes, seal stickers, and save-the-date stickers. There's space on the back to add your party details by hand. Priced around $4 for eight invitations, this is another money-saving option for budget-savvy party planners. Planning a child's birthday party is a lot of fun, but it's also a lot of work. Figure out how many invitations you'll need, select your design and add your party details, and then send them out about three weeks ahead of your party date. You can breathe a sigh of relief that this particular task is done and move on to planning the rest of your little ninja's party.